I’ve spend quite a few unhappy minutes searching for software that can make backups of FTP server of this blog. Backup software is much more focused on making backup to FTP and that makes search painful since keywords are same. Naturally I have all original files stored locally but Windows Live Writer creates rather weird directory structure that would be pain to recreate if something happens. Suddenly I remembered that I had Cobian Backup bookmarked to check out and it became perfect match to my needs. Cobian Backup is long-developed and full featured solution. plenty of other stuff I hadn’t discovered yet. Interface is very polished and easy to work with. Main interface acts as holder for list of tasks and information area. 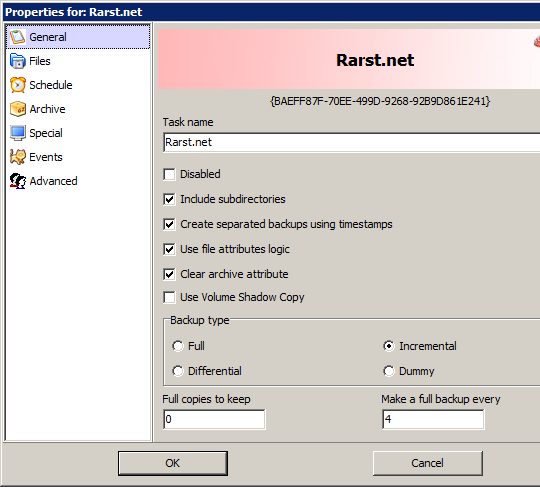 Task > New Task (Ctrl+A or new task button) creates new backup task. There are numerous options here and since app has plenty of hints and detailed help I won’t go into boring details. I’ve created simple task that backups three folders from my FTP (images, WordPress theme and plugin folders) to zip archive on my local drive every week. I’ve pointed it to my working blog directory so it will be copied to my external drive every time I sync using SyncEXP as well. Solid and freeware backup solution. Very polished, very flexible. Not sure how portable it is – Softpedia lists (unofficial?) portable version for download while Portable Freeware Collection lists it as rejected for using user profile name while saving settings. Still I have SyncEXP that is more suitable for on-the-go sync. Yep, it’s very important to automate backups. If doing them manually people try to skip them and making them less often to escape boring task. Thanks, you made me discover Cobian backup and I find it is a very good replacement for other solutions I was using so far (special mention: much more powerful than Norton Ghost for backuping file, much simpler, and free!). I was also very interested by its ability to backup remote data (FTP source). I tried this feature today and was a little bit disapointted by the fact that when you backup remote FTP sources, Cobian Backup can only do FULL backup. This means that it downloads all files every time, which in my case where there are very few files that changes from one time to another, makes it not so efficient. Not to mention that is also creates a new directory for each backup (FTP source), meaning that after a few backups, I end up with several copies of my remote source. I then have to do manual cleanup, unless I miss some cool setup option in Cobian. Do you have any other free and reliable solution to suggest for backuping remote FTP source in a more incremental way? I still use Cobian for this myself, so have no beter offer. At least for now. :) Problem with FTP it is much less convenient for determining file differences and such. Protocol was designed for download and upload, not complex file system iterations. If there are only specific files that get changed you can try filtering, I hadn’t used that option much personally. To keep things clean I do following – archive option (files get compressed into single zip with date) and set number of Full copies to keep at four. With weekly backup this setup retains backups for last month and automatically deletes older ones. Started Googling for exactly this, with no usable results. Then I figured that you probably had looked for something like this… And lo and behold, you of course had! Note that this doesn’t scale well for large quantities of files (hundreds/thousands). As number of images in site grew over time backups became unreasonably long. I had since moved to scripted SSH backup routine with WinSCP, that compresses site’s content into single archive and it gets downloaded much faster. I would like to be able to use SSH to do some kind of backup, but my current host doesn’t allow it. I’m also looking into using cron jobs to compress and send or FTP to me. Same here, I spent like half an hour trying to filter the keywords I was using, till I got to this blog post. I need to backup my hosting account files and was lloking for the same thing, a backup software that would use FTP also as a source, not only a destination. Thank you very much, I’ll give this software a try. You are welcome. If you have SSH access to hosting be sure to check my post about pre-compressed backups with WinSCP (link couple comments above). It is much faster for large amount of files. Good Jobs. Thanks you very much! Is it not better to use a WordPress based backup plugin? You then get the database and all the data required to restore the site – not sure why you’d only want to backup a portion of it. It depends… While the WP plugin has benefits of being in WP environment and such, it also suffers from dependency on that environment. Basically it wins in convenience but loses in reliability. Really solid and redundant backup strategy for WP should probably include both in and out of WordPress backup.